The only reason she's 'accepted' by any circling-like-vultures JWs is because she has money. No surprise there .... but their fame also has ramifications. How would it look in the media if she was publicly disfellowshipped? Michael Jackson and Prince, both drug addicts that killed themselves, contributed a GREAT deal of money .... every month ... and it bought them complete immunity from Congregational sanctions. EVERYTHING that is going on today in Big Org ONLY makes sense when you realize that the Society's Lawyers, and Accountants, and the GB "Helpers"are setting the rules, and running the show. No other explanation makes any sense at all. 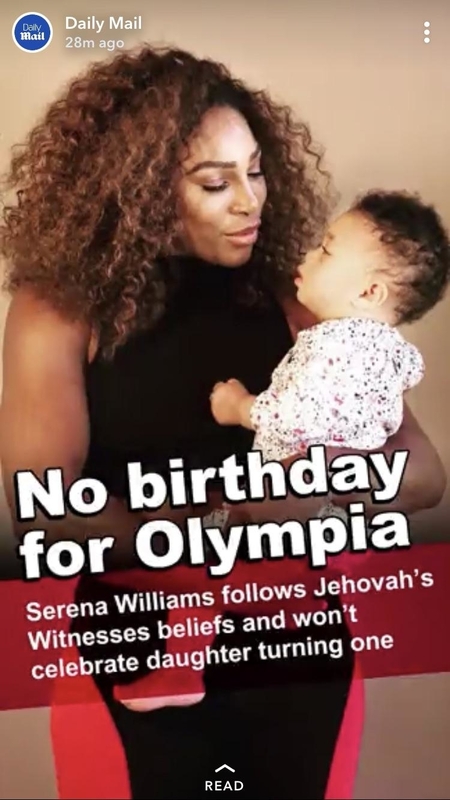 Alexis Ohanian shared a snap of Alexis Olympia, his daughter with his wife, professional tennis player Serena Williams, on Instagram for the girl's first birthday Saturday. Another wrote, "who remembers that anyway? Respect their beliefs." "I'm not a Witness, but I considered how made up it all is: the purpose of celebrating a birthday is to celebrate life with the people who love you (and to eat cake)," he told the user. Ohanian added, "This baby is loved and will get to celebrate life with people who love her *plenty* of times, with plenty of parties (and eat cake -- in moderation) throughout her life."